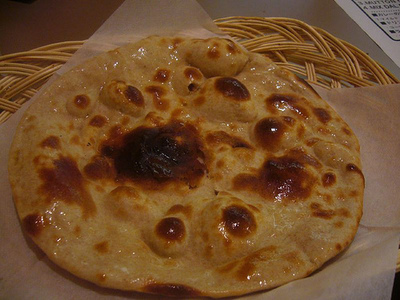 This tai roti recipe (shallow fried cottage cheese bread) isn't the easiest thing in the world to get right but it is so worth it! I never understood why it is not more popular. In a big bowl grate the cottage cheese, cabbage and the capsicum and then add the flour. Pour in a little milk and stir thoughly untill it forms a hard dough. Next you need to dived the dough. You should have enough to make about 20 portions 10 cm wide. ON a griddle or under the grill if you have to, roast both sides untill they are about half done, a little brown but still un cooked. These disks can be kept for about 8 hours like this so they are a good job to do in the morning. Before you serve shallow fry them untill they go really golden and ccrispy and serve hot. 5. Before serving, shallow fry the discs on a griddle till golden and crisp. The discs can be roasted on a coal fire or in a tandoor. To avoid the use of ghee.